← Simons, spread the love! Yorkdale Shopping Centre is about to get bigger, if you can believe it. A $220-million expansion project that begins this month will add 40 new stores and more than 145,000 square feet of new space to the already huge mall. A sketch of the mall's new wing. 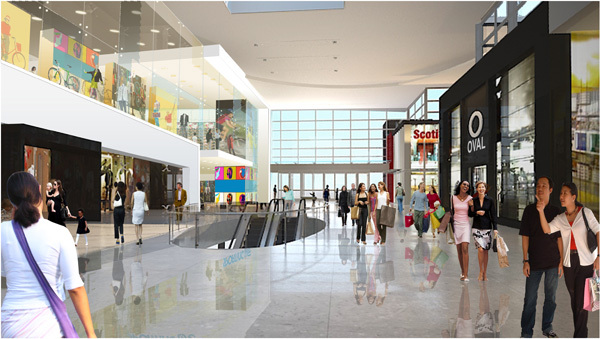 Altogether, the mall will have 265 stores when the expansion is complete at the end of 2012. A number of the new additions will be “first-to-market” brands, which I’m guessing will include retailers from the U.S. and Europe that are planning to break into the Canadian market. The expansion will also include more than 800 new underground parking spots, which the mall can certainly use, given the chaotic state of its parking lot on any given Saturday. As part of the project, Yorkdale’s food court will move from its current spot to the vacant third floor of the former Eatons store. It will boast double the number of seats of the existing food court, several new food vendors, and a new patio and skylights for natural light. It will be nice to see some fresh new stores in the GTA. 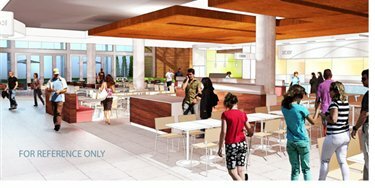 And it sounds like the bigger, brighter food court will be a nice place to stop for a shopping break. A sketch of the mall's new food court. Given how big the mall already is, though, it’s almost hard to imagine Yorkdale getting much larger. The last expansion was completed just six years ago, and it seems pretty quick for the mall to be embarking on another, even bigger growth project. But at the same time, the massive crowds that frequent this mall suggest that Yorkdale will have no trouble filling this new space with eager shoppers. The mall’s location directly off the 401 makes it an accessible destination for shoppers all over the GTA, and as the region continues to grow in population, this mall will probably continue to grow, too. I’m anxious to check out the new Yorkdale when it’s complete in a couple years, but I’ll definitely be wearing some comfortable shoes when I do.